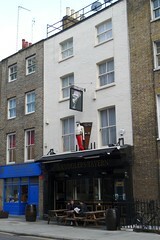 Fairly modern locals' pub on Warren Street. The decor is unpretentious, with wooden tables in a single rectangular room, the space broken up by columns. On a Friday evening visit, there were still tables available and it never became exceptionally busy. There are also a couple of tables out the front on the street. It doesn't have a particularly interesting selection of drinks. There are four handpulls, with two ales available on Ewan's visit in October 2011 (Hobgoblin and Greene King IPA, both perfectly well-kept, £3.40 a pint). According to DrHyde, it does decent Thai food fairly cheaply, making for a good lunch. As is fairly common in pubs doing Thai food, you have to pay for food and drink separately. Service is not particularly fast, even when they're not busy, so don't expect to just pop in, grab a bite and leave in a few minutes. Last visited by Ewan and friends, October 2011. Last edited 2013-05-10 08:03:43 (version 9; diff). List all versions. Page last edited 2013-05-10 08:03:43 (version 9).